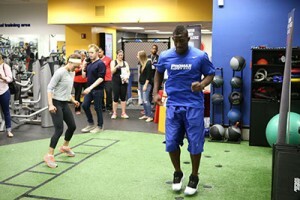 New York Giants safety Antrel Rolle teamed up with Promax Nutrition protein bars to host a workout with Henry Hynsoki and Spencer Paysinger at NYSC in Mid-town earlier this month. Some members of the media had a chance to work out with Antrel and the rest of the crew. I was able to ask Antrel a few questions on the workout with Promax Nutrition and his time in the NFL. Art Eddy: You worked with Promax Nutrition bars for an extreme workout. Tell me a bit about the event? Antrel Rolle: The event was to show some of the workouts that we do on a day to day basis. We did some speed, agility, and strength drills. Just a little preview but we definitely got them to break a sweat. Doing these workouts you are burning off energy, so Promax Nutrition protein bars are perfect to keep your energy levels up throughout our long days of practice. AE: Were the exercises that you guys did similar to your own workouts to get ready for the NFL season? AR: Definitely. These are some of the warm-ups and drills we do at the facility and even now in the offseason. AE: Speaking of the NFL you and the rest of the New York Giants reached the top of the NFL mountain when you guys won Super Bowl XLVI. How long did it take for that win to sink in? AR: In the moment everything was happening so fast that it took me a few days to realize what had just happened. One of the best memories I will have. AE: Your position is defensive back. In a league that has a major focus on passing the ball what are some of the major things that you look to focus on as you prepare week in and week out? AR: I study my tapes and learn the ways of the receivers. I like to know how my opponents think so I can prepare for them. I constantly work on my speed and receiving as well. AE: Is there a player that challenges you the most on the field? AR: The guy who challenges me most on the field is LeSean McCoy. He is the hardest guy to tackle in the open field of play. AE: Last season you had a great season with six interceptions and two sacks. What type of goals do you set for yourself before each season starts? AR: I like to take things one game at a time. The ultimate goal is to get to and win the Super Bowl of course, but I have daily goals and weekly goals that I set for myself throughout the season. Gotta push through and be better than the day before. Print article This entry was posted by Art Eddy III on May 21, 2014 at 6:28 pm, and is filed under Sports. Follow any responses to this post through RSS 2.0. Both comments and pings are currently closed.